We are open until 4:30am Friday & Saturday and until 2:00am Sunday thru Thursday. 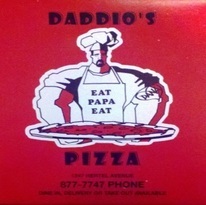 Daddio's Pizza is located at 1247 Hertel Avenue (corner of Commonwealth) in North Buffalo. Call us at 716-877-7747 to place your order!